“...a tremendous test for the highest quality player and great fun for the modern competitor”. Peter Alliss Co. Sligo Golf Club has hosted most of Ireland’s major championships over the years. Three extended beaches beneath the cliffs keep the Atlantic at Bay to the west of the course while towering Benbulben competes with the ocean for scenic splendour on the land side. For golf travel in Ireland, you will find many of the finest golf courses within easy reach of each other – such as Enniscrone, Co. Sligo and Donegal less than an hour apart. 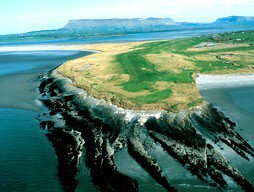 Ireland is home to one third of the world’s links courses and Co. Sligo Golf Club is a must for your golf vacation while embarking on golf travel in Ireland. County Sligo Golf Club is not yet in our pool of Golf Courses for orders.